The following FABClassroom post was written by Laura Kennedy, a third-grade teacher at the Sir Charles Tupper School in Halifax, Nova Scotia. From geometry to storytelling, she says that Fab@School Maker Studio has become a game-changer in her classroom. Fab@School Maker Studio is a hit in our class! I fiddled and tinkered with it a bit before showing it to my class and appreciated the “Ready-to-Go” options. I was intrigued and brave enough to tackle the automaton. The students were all eyes when I showed them what I made. What I didn’t know at the time was that the quietest of all the students in class was making mental notes of the design. She came to class the next day with a close replica of the automaton to share with the class. Not only was the feat of making one without the specific outline and instruction page incredible, even more so was that she asked to present it to the class. Being shyer than others she stepped out of her comfort zone and stood in the spotlight. She was beginning to find her voice and it was the act of creating and feeling proud of her accomplishment that helped her on her way. In this way, Fab@School Maker Studio was more than a fun way to represent ideas, it became a game changer. After attending the one-day FabMakerSummit in Boston, I was even more excited to share ideas with the class in creating, imagining and dreaming. Beginning with customizing bookmarks, students became familiar with the different elements to choose. What was most interesting in this case was not the instant communication and collaboration of ideas and peer helping but how another particular student rose to the occasion. This student usually requires various supports in the classroom. In this case though, the student independently worked diligently changing the color, texture and adding stamps. Each new element was proudly displayed and shared with others. Bookmarks might have been the task but confidence was the result. After I learned more about the different elements such as welding shapes and the 3-D viewer, I showed the class who picked up on these skills quickly. I remember mentioning how even how the teachers at the summit worked as a group to problem solve how to unweld shapes. To my surprise, in the time it took to share the story, the student next to me had figured it out and had an example to show our class. It was the natural discussions that were heard as the students were engaged in creating and learning on the go. We took this a step further and share our items with our Learning Buddy class of grade 1 students. 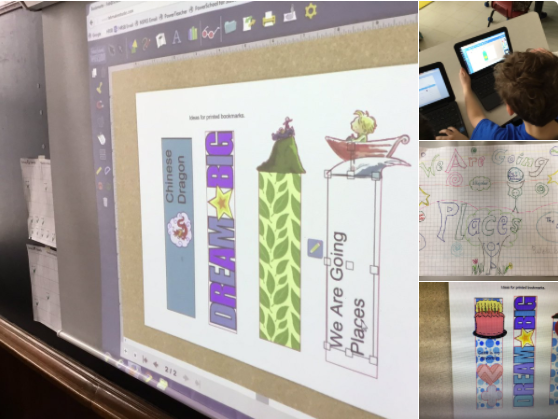 The grade 3-4 students became the teachers when they took the younger students through the process of customizing their own bookmarks. Connecting the Fab@School to geometry outcomes, students created 2-D shapes. They were modeled after our “Perimi-bot’ robots. Using multiple ways to demonstrate their knowledge benefits student learning and development of their ideas. Since Fab@School has a built in ‘intrigue’ factor, students are drawn to the program and spend productive time creating items. Storytelling to poetry to nonfiction facts of their design process add another element that expands the learning. Is your classroom a FabClassroom? We would love to feature your school in an blog post! To be featured in an upcoming post, send an email to info@fablevisionlearning.com. You can also tweet your photos with the hashtag #FabMakerStudio! For more posts featuring Fab@School Maker Studio, click here.